The Genome Science Symposium is coming up: Nov 2nd! "Accelerating Precision Health for All of Us: The All of Us Research Program"
Over the past few months, Dr.s Nunn and Timmins-Schiffman mentored 2 high school students through a proteomic examination of coral skeletal organic matrix. These 2 students prepared samples from corals, digested them for proteomics, analyzed the samples on a mass spectrometer, and analyzed the resulting data. Their findings were ground breaking! They then continued on to take this research to the Washington State Science and Engineering Fair in Bremerton WA in March of 2018. They won several awards (see below). Great job Christina Le and Hana Abay! Join us in Honolulu, HI and learn more about marine meta-omics at the ASLO conference. We are chairing a session on Friday, March 3, titled "Advances in Aquatic Meta-Omics: Creating Tools for More Accurate Characterization of Microbial Communities". We have some great talks and posters that address emerging bioinformatic and biological problems and solutions. Coming soon! Skyler Nunn's paper on diatom organelle proteomics is accepted and in final stages of review at the Journal of Emerging Investigators. Great work, Skyler!! 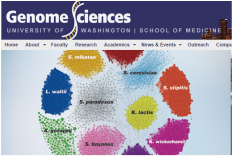 ISME Journal accepted post doctoral fellow Emma Timmins-Schiffman's paper that clearly demonstrates that metaproteomic analyses require site and time specific metagenomes for accurate assessments. GREAT JOB EMMA!! Thanks to everyone who contributed to the work!! Damon May (UW Genome Science graduate student), Molly Mikan (Old Dominion Univ. graduate student), Chris Frazar (UW), Mike Riffle (UW), Bill Noble (UW), Rodger Harvey (ODU). The International Ocean Sciences Meeting in New Orleans will host thousands of the world's leaders in ocean physics, chemistry and biology. Monday, February 24th our lab will be presenting a tutorial on how to use Skyline, a software ecosystem developed in the MacCoss lab where we reside. Additionally, we have multiple talks and posters being presented. Emma Timmins Schiffman will present at Combi seminar in the Department of Genome Sciences at the University of Washington. Emma will be presenting some of her latest research on metagenomics and metaprotemics in the Arctic Ocean and mass spectrometry detection limits of bacterial proteins within Eukaryotic matrices. A great example of a successful scientific collaboration. Through tremendous teamwork, graduate students and professors from Georgia Institute of Technology, University of Washington, and University of Birmingham completed the first metabolomic and proteomic survey of a diatom's response to alleopathic chemicals released by the red tide competitor Karenia brevis. The study required expertise in culturing multiple species of microscopic plankton living in the presence of the red-tide forming dinoflagellate, NMR and MS-based metabolomics, and MS-based proteomics. Our manuscript "Metabolomics and proteomics reveal metabolic impacts of chemically mediated competition on marine plankton" is published in the Proceedings of the National Academy of Sciences (PNAS). Authors of the work: Kelsey L. Poulson-Ellestad, Christina M. Jones, Jessie Roy, Mark R. Viant, Facundo M. Fernández, Julia Kubaneka, and Brook L. Nunn. The cover image was created by Yuval Boss- a fabulous intern in the MacCoss lab! SIGNIFICANCE: Microscopic marine algae (phytoplankton) are responsible for much of Earth's photosynthesis, serving as the base of a massive food web supporting fisheries. Phytoplankton compete for limiting resources, with some species producing noxious compounds that kill competitors or inhibit their growth. The red-tide dinoflagellate Karenia brevis is one such allelopathic species, causing growth suppression of other phytoplankton and negatively impacting coastal ecosystems. Metabolomic and proteomic approaches were used to characterize the sublethal physiological impacts of K. brevis allelopathy on two competing phytoplankton, providing insights into the physiological mechanisms by which allelopathy occurs and the metabolic pathways that enable resistance in co-occurring competitors. Cover image: Pictured are SEM images of two phytoplankton species, the cylindrical diatom Thalassiosira pseudonana and the heart-shaped dinoflagellate Karenia brevis, composed on a false background. Kelsey L. Poulson-Ellestad et al. investigated the effects of K. brevis, the causative agent of red tides, on two phytoplankton species. Energy metabolism remained robust in one species, but was disrupted in the other, suggesting that co-occurring phytoplankton species may evolve resistance to allelopathy, the suppression of growth and reproduction of one organism resulting from the release of chemicals by another. See the article by Poulson-Ellestad et al. on pages 9009–9014. Image courtesy of Brook L. Nunn (University of Washington, Seattle), Yuval Boss (University of Washington, Seattle), Nils Kroger (B CUBE Center for Molecular Bioengineering, Dresden, Germany), and Florida Fish and Wildlife Conservation Commission. ﻿Our manus﻿cript "Metabolomics and proteomics reveal metabolic impacts of chemically mediated competition on marine plankton" is coming out in the Proceedings of the National Academy of Sciences (PNAS) June 2nd, 2014 journal ﻿edition. This is the first time, to our knowledge, that Metabolomic and proteomic approaches have been used to characterize the sub-lethal physiological impacts of allelopathy on two competing phytoplankton. Our study provides insights into the physiological mechanisms by which allelopathy occurs and the metabolic pathways that enable resistance in co-occurring competitors. Authors of the work: Kelsey L. Poulson-Ellestad, Christina M. Jones, Jessie Roy, Mark R. Viant, Facundo M. Fernández, Julia Kubaneka, and Brook L. Nunn. Dr. Brook Nunn is presenting some of her research to The Department of Genome Sciences Wednesday April 30th in the Foege Auditorium. "﻿Using proteomics to understand the fate of carbon and nitrogen in the ocean: from blooms to Burial"
We had a spectacular 'omics' specific session at the ASLO International Ocean Sciences Meeting! Three independent investigator teams each submitted abstracts for the meeting that were all related to the latest and greatest proteomic, transcriptomic and metabolomic approaches being applied to the the ocean. As a result, these abstracts were merged, thereby creating a spectacular team of scientists with specialties ranging from global modeling to organism-specific quantitative proteomics. The great line-up of talks can be found at the link below. In collaboration with the MacCoss and Kolker labs will be presenting a hands-on-demonstration of chemical separations frequently used by our lab. We have a 5 foot tall chromatography column to experiment with and a super-magnetic race track mass spectrometer to test out! Come check us out at the Life Sciences Research Weekend. After searching for a long time, Brook Nunn joins Mike MacCoss's lab group in the Department of Genomic Sciences. Brook's official title will remain with UW Medicinal Chemistry since this is one of the few departments at UW that will allow her to be a Principal Investigator while not having to be a faculty member. This is exciting for Brook as she advances her proteomic work towards more targeted approaches such as SRM and MRM. Dr. Goodlett, director of the mass spectrometry lab in Medicinal Chemistry Department, announces his move to the University of Maryland. There, he will make big advances in lipidomics with his lab group.